We enjoyed these traditional sweets throughout the year growing up but especially on the first Wednesday afternoon of Lent. I know from family and friends that this is true of and a tradition in many areas of Greece but am not sure of the exact significance and would be very happy to hear if one of you might know! The filling is very similar to that used in baklava and is made up of just a few simple ingredients. Make sure to chop your walnuts pretty finely and mix the tahini paste into nuts well to incorporate completely. Mahlep (also mahleb and mahlepi) is a special flavoring used in this recipe. Its easy to order online here and makes a huge difference in both the taste and aroma of your final product – well worth waiting to add! Tahini adds a lovely subtle, nuttiness and orange juice with brandy make for a light, soft dough. Gently roll your dough out on a floured surface until it gets to about 1/4 inch thick rectangle and trim off the edges to square it off. 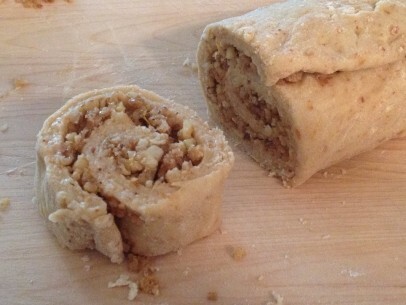 Spread the walnut filling evenly over the rolled dough and gently, firmly press the filling into the sheet of dough. This will make the next step of rolling neater and easier so make sure not to skip it! 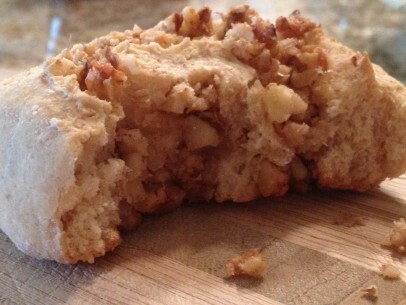 Carefully roll the dough up into a log. With your finger dipped in warm water, run a bead of water along the outside edge of dough and press to securely seal log. Use a sharp/serrated knife and slice approx. 1/2 inch circles from the log. 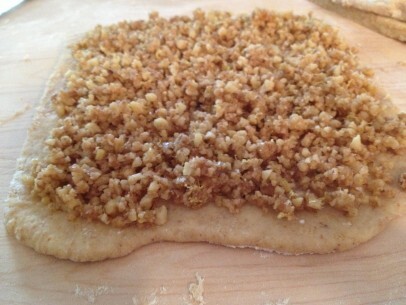 Arrange circles flat on un-greased baking sheet with about 2 inches between each circle. The cookies will rise and expand a bit so make sure they have room to grow! Bake for 25 minutes at 350 degrees and enjoy! Combine dry ingredients in a large bowl, set aside. In smaller bowl, dissolve sugar in orange juice and brandy. Stir in tahini and set aside. Make a well in the dry ingredients and add the wet ingredients. Mix well and knead into soft dough. At this stage you can cover with plastic wrap and refrigerate until ready to use. WARM over VERY low heat – sugar, tahini, cinnamon and lemon juice. Stir until mixture comes together in thick, smooth dark brown paste. 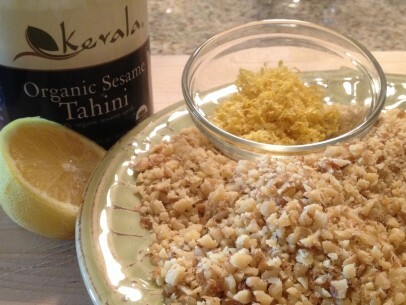 Incorporate warm tahini paste into chopped walnuts and combine completely. Add lemon zest and stir until completely combined. Divide dough into 2 halves. 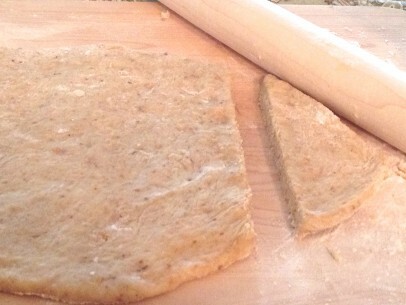 Roll out first half dough on floured surface until you get a 1/4 thick rectangle. Trim edges as needed. 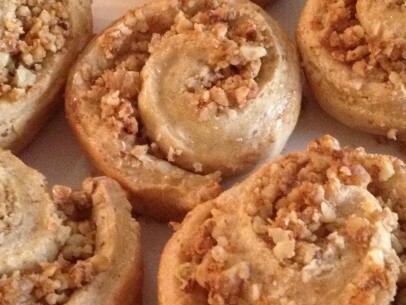 Layer on half of the walnut mixture on top of the rolled dough. Press walnut mixture gently, firmly into the sheet of dough. Carefully roll up rectangle into a log. With sharp, serrated knife, slice log into 1 inch circles. Repeat with remaining half of dough and walnut mixture. 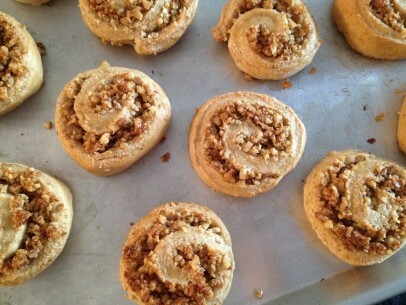 Arrange circles flat on un-greased baking sheet and bake in 350 degree oven for 25 minutes. This recipe yields approx. 1 1/2 dozen cookies and double and triples easily. ***If you’d like to go that extra step – brush the outsides of your baked cookies with a boiled simple syrup of equal parts sugar, honey (or agave nectar) and water. It takes another minute or two more but makes for a lovely sheen on the outside and a bit of extra sweetness!